Are you ready for the Big Game this Sunday? 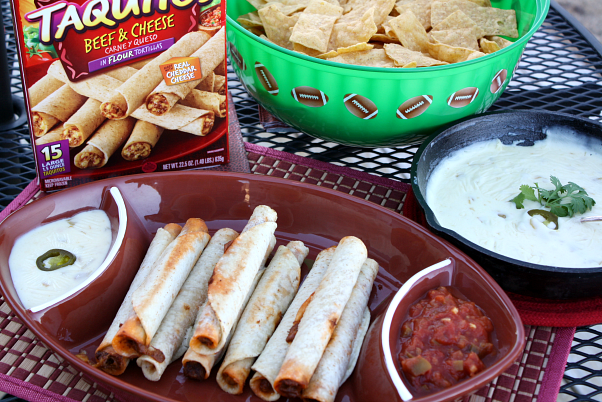 Whether you're staying home or attending a football get-to-gether game day appetizers and snacks are a must. 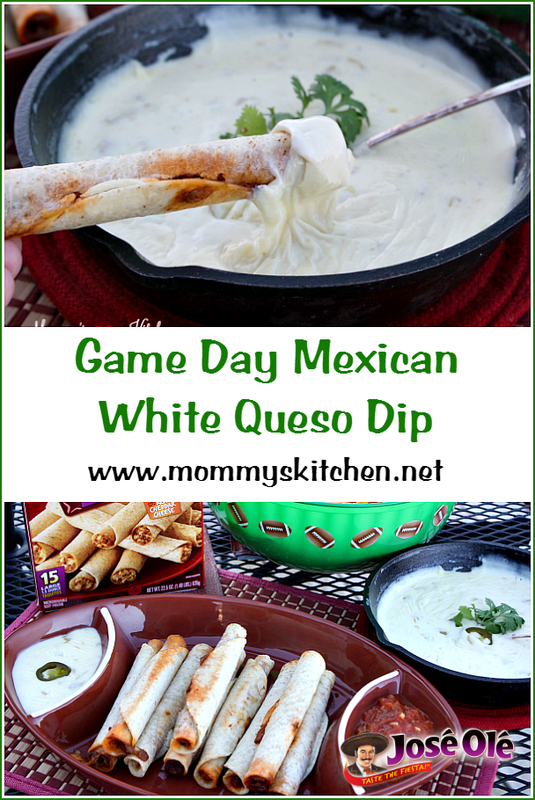 If you're looking for a quick and delicious dip to serve at your game day party, this ooey-gooey Mexican White Cheese Dip is perfect! This simple dip is similar to the Queso dip that you enjoy at your favorite Mexican restaurant and is perfect for dipping tortilla chips, taquitos, quesadillas or even veggies. 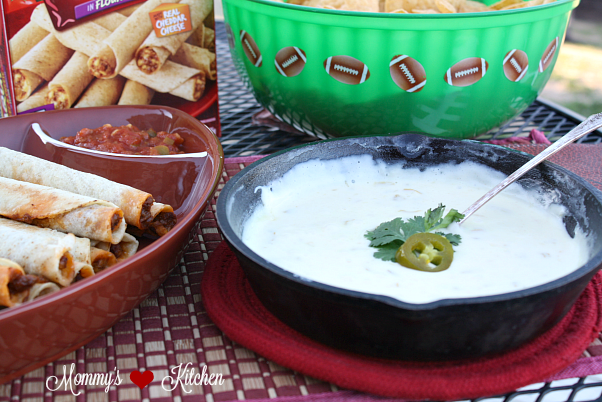 Recently I teamed up with Jose Ole® to share how I serve Jose Ole® snacks as part of my football celebration. Football really isn't my cup of tea, but all the guys in my house love it and they love to eat during the big game. I have to say even though I don't get involved in watching the actual game, I do love all the fun that surrounds it, the food, friends, the half time show and all the commercials of course. I guess you could say on game day my job is in the kitchen and making sure my guys have all their favorite snacks on hand. We always keep a few boxes of Jose Ole® snacks in our freezer. They're so convenient, bake up hot and crispy in no time and they're perfect for a crowd. 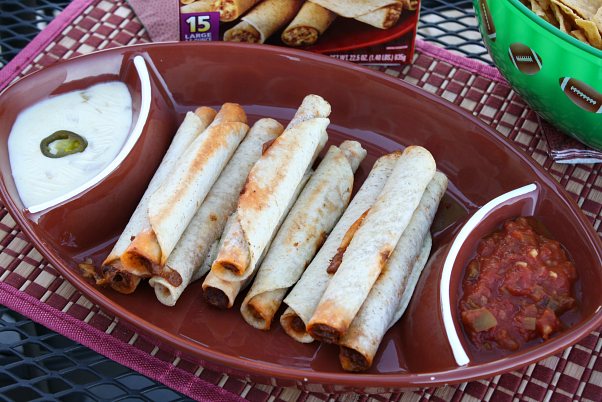 We love the taquitos and the mini tacos, especially for dunking in cheese dips, but they're also great as a starting point in so many recipes. 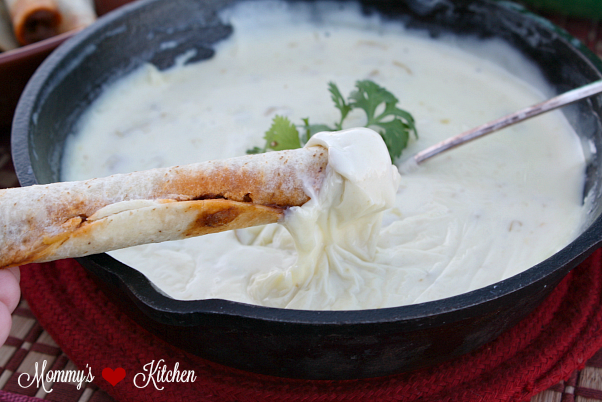 By far this Mexican White Queso Dip is our favorite and it comes together quickly with just a handful of Ingredients. 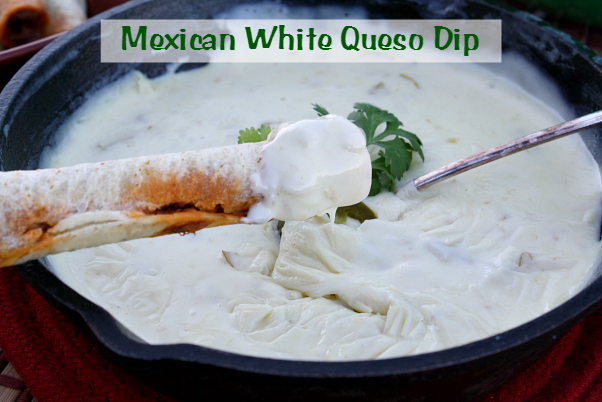 You know a dip of some sort is always a must for any football party or get-together and this White Queso Dip is definitely a fan favorite. 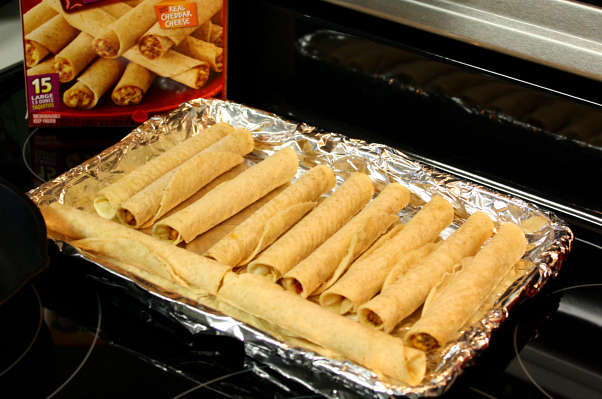 I hope you'll give this recipe a try and don't forget to grab a box or two of Jose Ole® snacks. Let's get started on this super simple Queso dip. Start by adding the cheeses, milk and butter into a medium saucepan or cast iron skillet over low heat. Cook until the cheese has melted, stirring frequently. Stir in green chilies, garlic and onion powder, to taste. Add more milk if needed to achieve the desired consistency. Heat through, add salt and pepper to taste and serve immediately with Taquitos, tortilla chips, veggies or even flour tortillas for dipping. 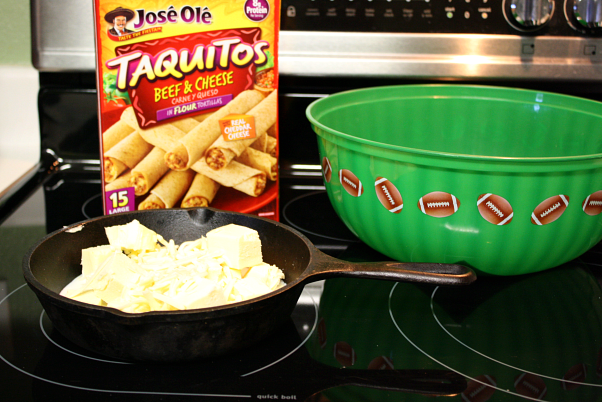 Jose Ole snacks can be cooked in the microwave or baked in the oven. I prefer to bake them because they turn out hot and crispy in under 15 minutes. Add cheeses, milk and butter in a medium saucepan or cast iron skillet over low heat. Cook until the cheese has melted, stirring frequently. Heat through, add salt and pepper to taste and serve immediately with Taquitos, and tortilla chips for dipping. Cooks Note: if you are unable to locate Queso Quesadilla cheese you can substitute with Monterey Jack Cheese or Pepper Jack Cheese (if you want it a bit spicy). for a .75 ¢ printable coupon for Jose Ole Snacks. This is a sponsored conversation written by me on behalf of Jose Ole . The opinions and text are all mine. Oh yes ! I'm in. Glad to find you. Have a nice weekend ! So beautiful and tasty! I have been try your recipe this weekend and I loved it!